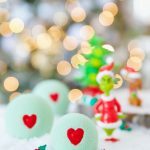 DIY Grinch bath bomb made for every Who down in Whoville! In a large bowl, combine citric acid, baking soda, cornstarch, Epsom salt and mica pigment powder. Slowly add the liquid ingredients into the dry bath bomb mixture, stirring quickly to disperse the liquid. Place a heart sprinkle in the center of the mold and firmly press bath bomb mixture into each half. Press the mold closed and allow to set overnight. Carefully remove bath bomb from mold and store in airtight container. Drop bath bomb in a warm bath and enjoy!